NBC Los Angeles has released another collection of new renderings for the MAD Architects–designed Lucas Museum of Narrative Art. While The Architect’s Newspaper published several of these new renderings back in May, the latest release includes three new images depicting the public loggia located between the building’s two main entry pods. The renderings depict a series of bubbling masses rising from the surrounding parklands with what appear to be metal panel-clad bubbles and domes stretching up out of the ground. At one end of the loggia, the bubbles conceal a restaurant space; on the other, they shelter entries to a library and digital classrooms. At the center of the loggia, the building’s mass rises to its crescendo, where it is capped by a central oculus. The dome’s descending pendentives frame the complex’s two main, glass-clad entrances. One end of the loggia contains entrances to an amphitheater while the other end leads to the museum’s principal entrance. The oculus above is framed in glass curtain walls, allowing visitors to see below from above. The inside of the entry spaces is clad in wood paneling, similar to MAD Architects' treatment for the Harbin Opera House in Harbin, China. The Lucas Museum is expected to begin construction in September of 2018 and open in 2021. The Los Angeles City Council voted this week to grant final approval for the MAD Architects–designed Lucas Museum of Narrative Art. 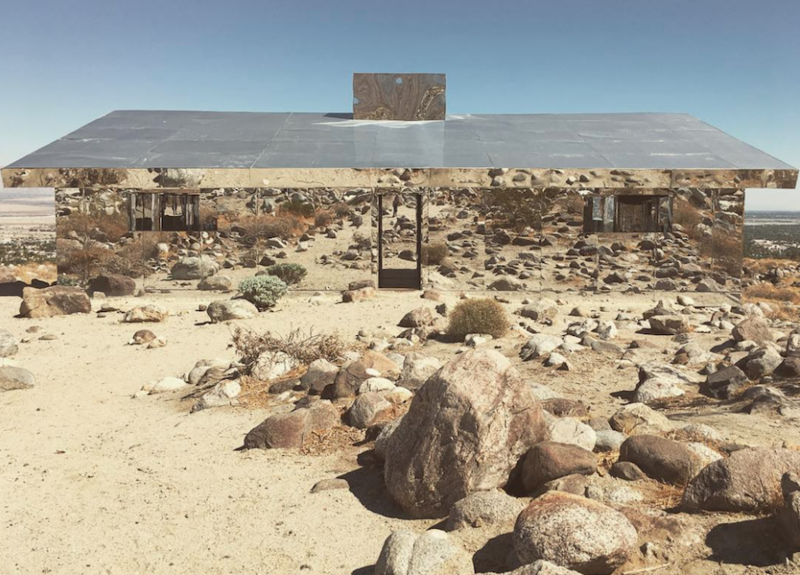 The most recent iteration of the project—sited in Los Angeles’s Exposition Park, across the street from the University of Southern California, George Lucas’s alma mater—represented the third attempt to find a home for the itinerant museum-to-be. Previously, Lucas and his wife Mellody Hobson, who is the chairperson for DreamWorks Animation and a driving force behind the project, had tried for two separate sites, first in the San Francisco Presidio and later in Chicago’s Jackson Park. Both efforts were rebuffed by community activists. Last fall, the Lucas Museum board of directors made another push for California by selecting two potential sites in the Golden State, with a site on San Francisco’s Treasure Island and one in L.A.'s Exposition Park competing for the $1 billion museum. The Los Angeles site was chosen earlier this year amid much public fanfare on the part of elected officials. Some, however, fear the project will bring increased gentrification to the working class neighborhoods surrounding the park. The proposed 300,000-square-foot complex will rise five stories—roughly 115 feet—and contain a movie theater, lecture hall, library, restaurant, and digital classroom spaces, all in addition to its galleries. The boat-shaped structure, according to renderings, will be lifted off the ground via two large piers containing the ancillary programs mentioned above. Three floors of continuous gallery spaces will span above the piers, with a planted rooftop terrace capping off the entire complex. The museum will be underpinned by a 2,425-stall parking complex located underground and will be surrounded by nearly 11 acres of new parkland. The museum’s collection, according to the Lucas Museum website, will be divided into three categories: Narrative Art, Art in Cinema, and Digital Art. The museum will also make its debut with a $400 million endowment. The unanimous approval from the L.A. City Council paves the way for the museum to break ground in 2018. The museum is expected to open in 2021. 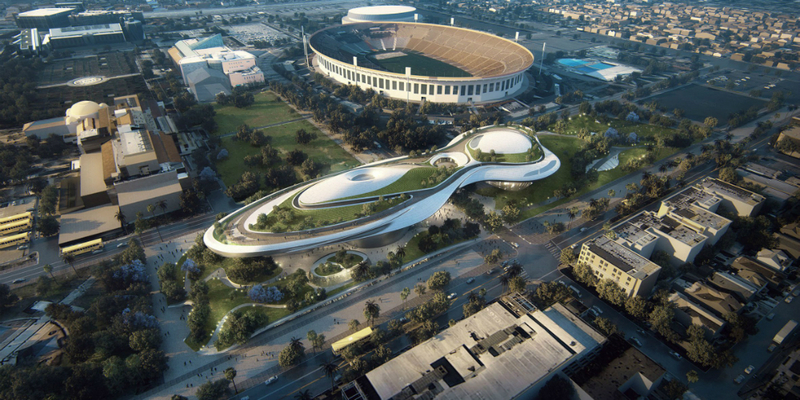 MAD Architects’ proposed designs for the Lucas Museum of Narrative Art in Los Angeles have undergone a slew of design changes, according to documents filed with the Los Angeles City Planning Commission (LACPC). The documents, first reported by Urbanize.LA and filed in advance of a forthcoming meeting between the project’s backers and the LACPC set for May 11, come roughly five months after the museum board chose Los Angeles’s Exposition Park as the preferred site for the new $1 billion complex. L.A. was chosen in January over a parcel on San Francisco’s Treasure Island. 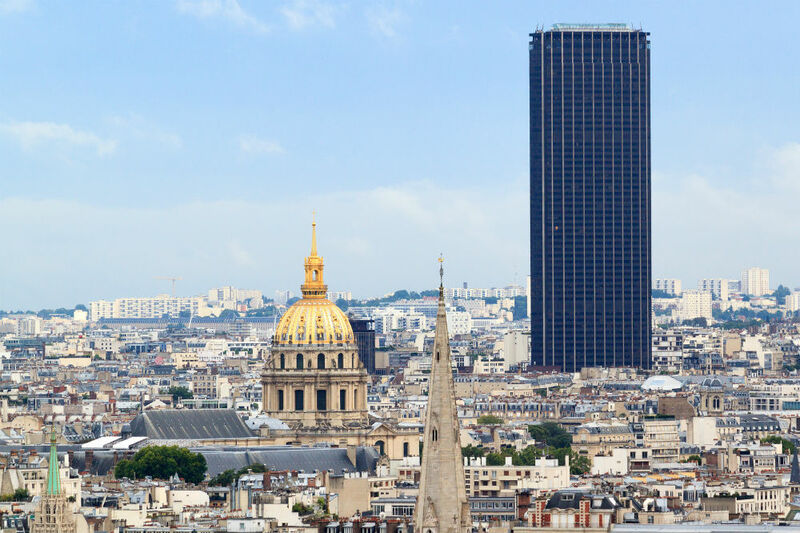 The two California cities were briefly in competition with for the complex after backers abandoned an earlier pitch made for Chicago, Illinois. Now, as the project moves toward its projected 2018 construction kick-off, developers for the project are making their way through L.A.’s dense building approval process. The planning document calls for the construction of a 115-foot-tall museum, education, and leisure complex that will contain a restaurant, movie theater, lecture hall, digital classrooms, library, and event spaces in addition to gallery spaces. The project—unlike the proposed bids for San Francisco or Chicago—will contain a massive amount of parking: 2,425 stalls contained within a three-level subterranean garage. The 300,000-square foot complex will be organized with a collection of ground floor open spaces that connect to an 11-acre, park-like site. 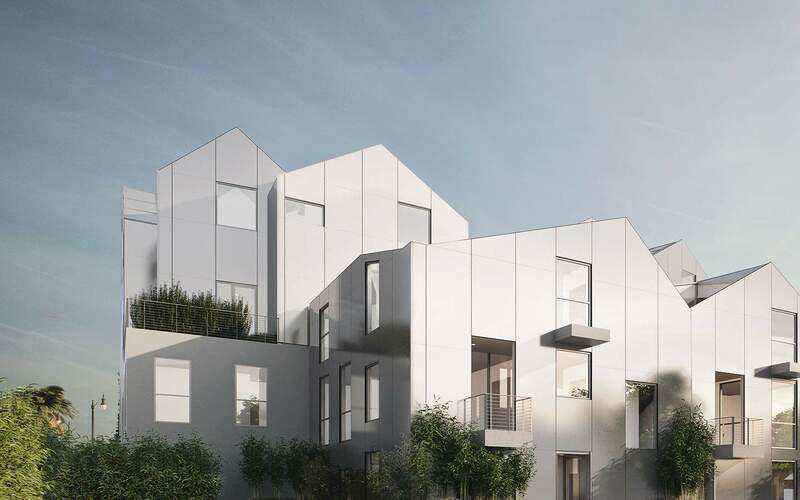 A rendering contained within the document indicates that the complex has tightened up, programmatically-speaking, and occupies a both a wider footprint and tighter envelope than before. The complex will be organized within an arrangement of dual, three-story piers topped by a continuous, two-level gallery block. The ground floor of the southern pier will contain archives and offices, with educational spaces on the second floor, and the library on the third. The northern pier will contain a pair of theaters and a main entry pavilion for the museum. A rendering included in planning documents shows a sinuous, metal-clad structure topped with trees and planted areas. The renderings differ somewhat from earlier designs and include the addition of a new underground space located below the project site. Construction for the project is expected to begin in 2018 and complete in 2021. The Board of Directors for the Lucas Museum of Narrative Arts elected this afternoon to pursue Los Angeles as the latest site for their troubled museum proposal. The decision marks the third time the museum board has attempted to find a site for the $1 billion, MAD Architects-designed scheme. The firm's initial San Francisco proposal was rebuffed in 2015. The team made a try for a site in Chicago, only to scrap the plans in the face of fierce opposition to the project by a local community group known as Friends of The Park. Instead, Los Angeles's Exposition Park, home to the Los Angeles Memorial Coliseum, California African American Museum, California Science Center, and the Museum of Natural History of Los Angeles County will now potentially host Lucas's namesake museum. The Los Angeles proposal was selected after the museum team made parallel pitches for a second site on San Francisco's Treasure Island and one in L.A.'s Exposition Park. The new museum, if built, will be located along the city’s Expo Line light rail line, within proximity of the forthcoming Gensler-designed Los Angeles Football Club soccer stadium, and would cap a park already brimming with global cultural and entertainment destinations. In announcing their decision, the Lucas Foundation's board of directors extolled the virtues of the urban park and its surrounding neighborhood, saying, "While each location offers many unique and wonderful attributes, South Los Angeles’s Promise Zone best positions the museum to have the greatest impact on the broader community, fulfilling our goal of inspiring, engaging and educating a broad and diverse visitorship." In an effort to preserve the green spaces of the park, the selected scheme will include public open space on its rooftop. Renderings for the proposal show the curvaceous museum located in a leafy, park setting topped with tufts of greenery. The museum also appears to gingerly touch the ground by coming down in a series of large, discrete piers. It's still unclear what sorts of developmental hurdles the museum will need to surpass prior to start construction, but the project clearly has a fan in L.A. mayor Eric Garcetti, who after learning of the decision, remarked to the Los Angeles Times, “It’s a natural place to have this museum in the creative capital of the world and in the geographic center of the city. It’s a banner day for L.A.” This article appears on HoverPin, a new app that lets you build personalized maps of geo-related online content based on your interests: architecture, food, culture, fitness, and more. 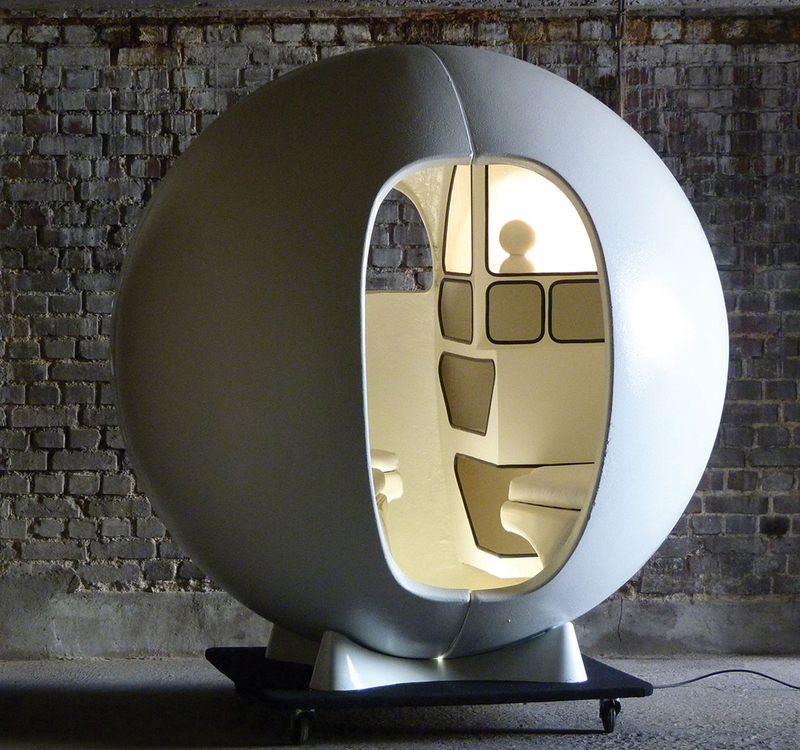 Never miss The Architect’s Newspaper’s coverage of your area and discover new, exciting projects wherever you go! See our HoverPin layer here and download the app from the Apple Store. 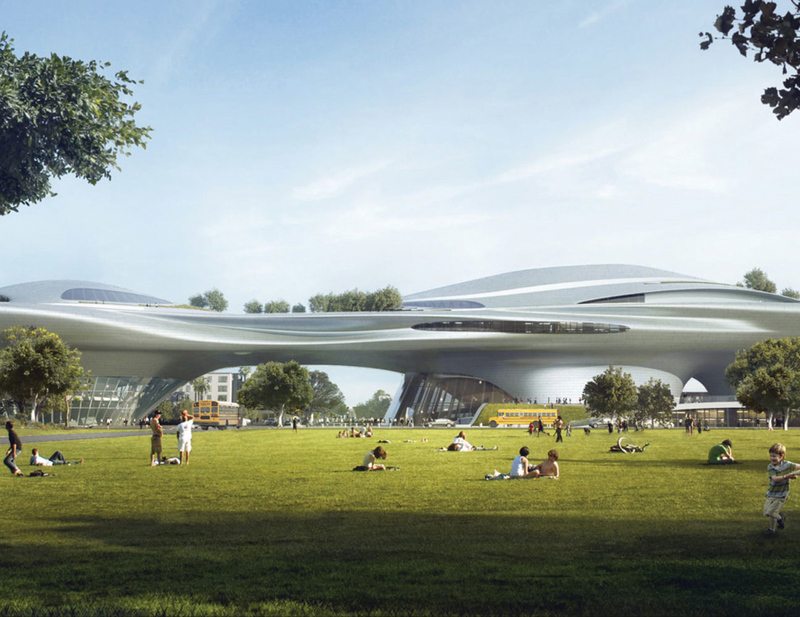 Weeks after dropping a long-stalled bid for a Chicago location, MAD Architects and the Lucas Museum of Narrative Art have released a collection of renderings for competing schemes aimed at finding the wandering, proposed museum a welcoming home in either Los Angeles or San Francisco. The firm’s proposal for the Chicago location was scrapped earlier this summer after fierce community opposition to the project, to be located on a coveted site along the city’s waterfront in Grant Park. Despite strong support from the city's political class, the $700-million scheme, reminiscent of a futuristic, pitched tent, was ultimately killed by a lawsuit filed by the local community group known as Friends of The Park. The new proposals, being shopped simultaneously between California’s two largest cities, are being presented as pedestrian-friendly, public spaces for each respective city. Both are arranged with expansive second-floor gallery and exhibition spaces that are lifted up on massive piers that allow for park and pedestrian areas to stretch underneath each complex. Each would be 265,000 and 275,000 square feet of overall interior space, with roughly 100,000 square feet of that dedicated toward gallery functions. The Los Angeles Times states that the overall project cost, including a future endowment for the museum, could potentially top $1 billion. The San Francisco proposal for is being pitched for the city’s Treasure Island and is being incorporated into the SOM-designed master plan for the island community’s waterfront. 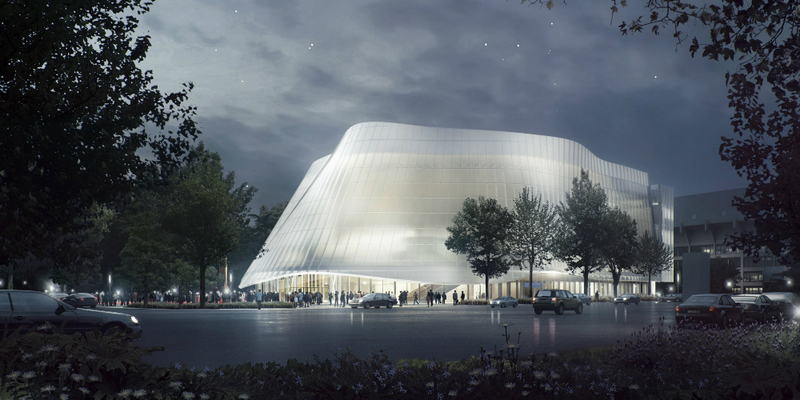 The building’s rigid-looking exterior skin, punctured by two expanses of glass swoops, culminates in what—based on renderings released by the firm—appears to be a large auditorium space. Aside from the wavy building, these renderings also depict the building’s surrounding ground floor areas as being hardscaped plaza with pedestrian connections to the surrounding waterfront areas. The Los Angeles proposal, on the other hand, would be located in the city’s University of Southern California-adjacent Exposition Park. Located along the city’s Expo Line light rail line and within proximity of the forthcoming Gensler-designed Los Angeles Football Club soccer stadium, the proposal would cap the slew of other cultural and entertainment destinations in the park. Despite the light rail proximity, the scheme includes a 1,800-spot underground parking garage that the San Francisco locale does not. Also unlike the San Francisco proposal, the Los Angeles scheme would include public open space on its rooftop. Renderings for the proposal show the museum located in a leafy, park setting with people lounging on the knolls surrounding the structure. For now, as always, the schemes continue to be just that: hopeful proposals. Time will tell if one or the other scheme gets selected for either city and, more importantly, if one eventually gets built. A decision regarding the location is expected to be made within the next two- to four-months.